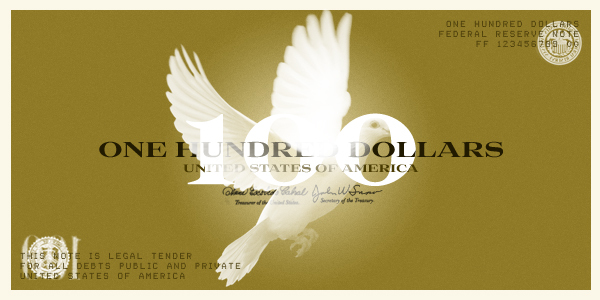 ‘My $100 and $1 rebrand concept takes elements of the existing designs and works them into something entirely new and unique. 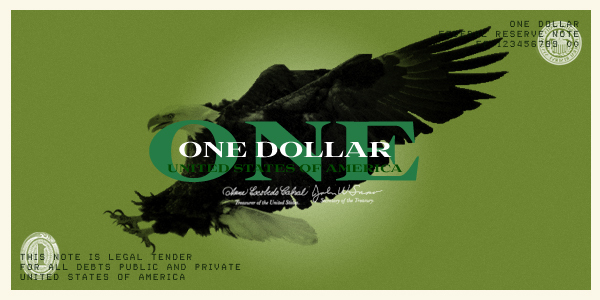 My aim was to preserve the integrity of the design and value of the notes, while bringing them into the 21st century with something that possesses both classic and modern elements and is unencumbered by any unnecessary decorative details. The rationale behind my design is threefold. 1. American’s are in debt. The world is in debt. There’s no one simple solution, however something that is rarely considered is the way that we think about and treat money itself. So often money is referred to as “cash” and it’s crumpled up into wallets, passed indiscriminately from grubby hand to grubby hand, and it’s rarely given the reverence that it deserves. How often do we receive a bank note and think “I earned this” ? We work hard for our money, so why do we so often waste it on junk? Perhaps if a note was designed more like a luxury item itself, we’d be less inclined to part with it and waste it on trivialities and things we simply don’t need. Most high end stores have beautifully designed gift-vouchers, which gives the item an air of exclusivity and specialness. They’re usually given on special occasions, and they instantly turn the recipient into a more discerning shopper. Perhaps if notes were designed more like these they would encourage us to save, and to think twice about how, why and where we invest it. 2. Security. This is obviously one of the most important considerations in designing a note. I have four (hypothetical) security features at work here. The first is a set of specially designed metallic inks printed on the polymer surface. These green and gold formulas would be instantly recognizable and extremely difficult to copy. 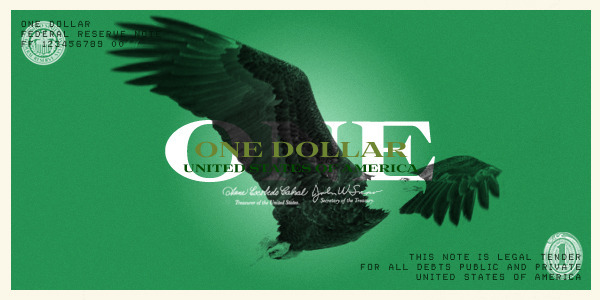 The green recognizes the previous note design, as the American currency is still widely known as the “greenback”. The gold represents value and wealth. It has gravitas and contributes to the “luxury” feel of the rebranding. In order to stay a step ahead of potential counterfeiters, the formula could be modified slightly between editions. Working in conjunction with the inks are holographic images of birds in flight. Each side of the notes feature a slightly different hologram, and the absence of this holographic feature would reveal a counterfeit immediately. And finally the type in the top left and bottom right hand corners would be a bespoke dot-matrix font, which would be printed with raised ink. This security device would also allow for Braille elements for the vision impaired. This is all printed above two transparent seals, which are taken from the previous iterations of the note. These innovative security measures allow for a more minimal design, replacing the need for complex illustrations and guilloche. 3. The message. Firstly, a message to the world. 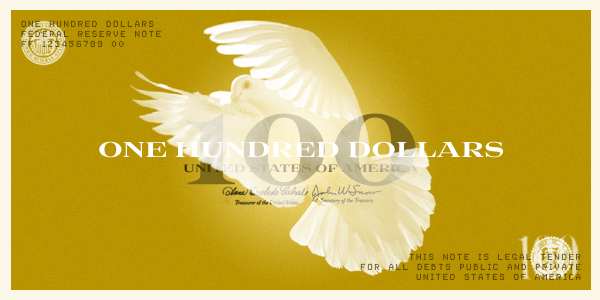 The dove itself an internationally recognized symbol of peace, and placing it on the $100 note would be a bold statement from a country that has come under a great deal of international condemnation for its part in wars around the world. Ultimately it is a highly visible message about hope and the desire to co-exist peacefully both at home and abroad. Hi, it? ?s a nice job, but looks closer (idea) of Erickson Diga? ?s design from 1997 (u can see his job at HOW august 1997 edition). But, it? ?s nice.